Every Easter I reminisce about how fancy we all looked at Easter Sunday Mass when we were in our formative years. We three girls always got a new dress and hat. My brother probably got a new clip-on tie. My preference for a hat was white or yellow straw with a ribbon around the brim that dangled down my back. Since Mom always had our hair really short, I would swing my head around and let the long ribbon flip over my shoulder; I could then pretend it was a pony tail. If we could wear patent leather shoes that clicked when we walked, we were in seventh heaven. Lest you think I’m kidding about the short hair….. When Jen sent me this photo last week, I forwarded it on to Bec. In the accompanying text message, I said I’ll bet every other girl in Columbus, Nebraska, had long hair. Bec’s response was Well that’s because their mom didn’t have a great stylist for them. Bec’s response, of course, was tongue-in-cheek because our haircuts were horrible. 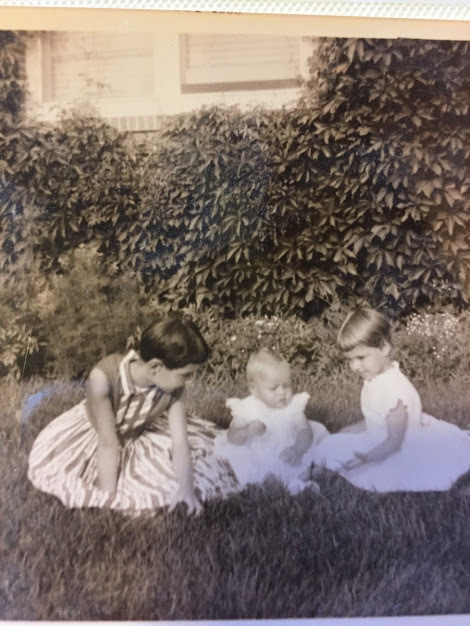 Not only were the bangs always – ALWAYS – crooked, but the hairdresser (which is what we used to call the person who cut hair) used a razor to cut our hair, and I think – judging on the painful way she yanked at our hair – that the razor had never been sharpened. I also think she hated kids and took it out on us. In the above photo, Jen temporarily escaped the pixie cut because she was too little. Instead, she sported the curl-on-top-of-her-head, ala Gerber baby. We all endured that particular embarrassment (except Dave, who instead had to wear a stupid cardigan for his obligatory baby picture). The reason Jen sent me some photos was because I had put a call out to siblings for a particular photo that I vividly recall. The four of us were standing in front of our house in what I think was our Easter finery (though Bec thinks it might have been mid-summer). We were wearing new clothes and spiffy hats and Dave had on a brown plaid sports coat. He, being probably 6 or 7 in the photo, was making a goofy face, something he did for his entire childhood. We were not able to get our hands on that particular photo. We did, however, find this photo….. 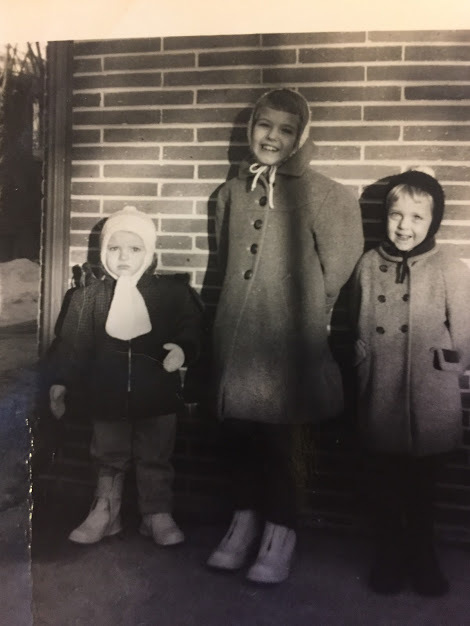 I don’t know why our mother had us out on what clearly was a very cold day to get our photo taken. Judging from my brother’s face in this photo, he was certainly not happy about the whole idea. When I texted him with the photo attached, I asked him why he was so unhappy in the picture. I’m pretty sure it was the outfit, he responded. 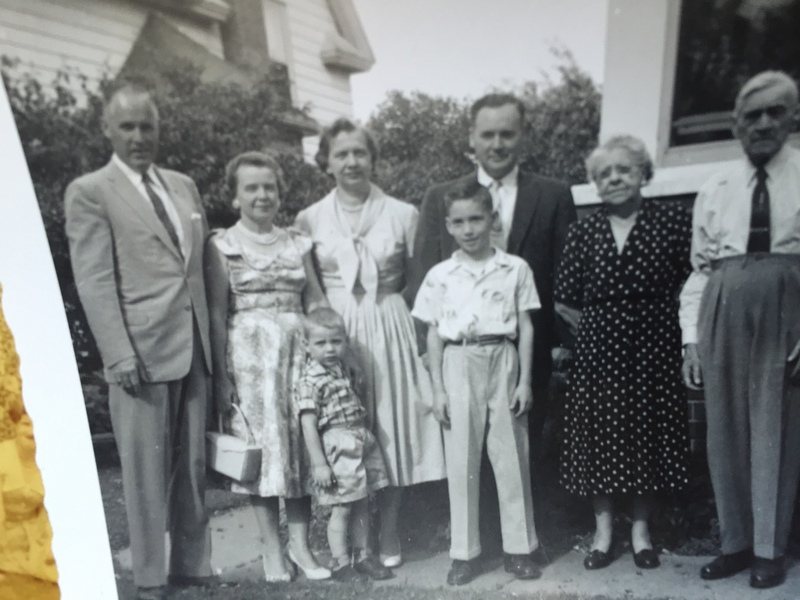 Speaking of Easter finery, here is a photo of Bill and his family on what must have been an Easter Sunday…. He(the skinny kid in the middle of the photo), too, was decked out in church finery. As for us, our Easter Sunday was a blessed day. We went to sunrise Mass, and shockingly, made it right on time. 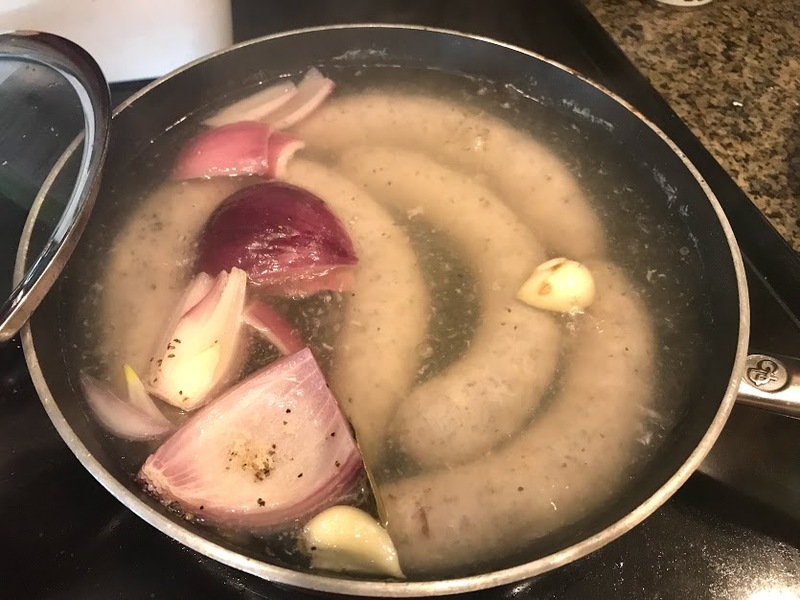 When we came home, I made my Polish sausage and soft-boiled eggs, with cheers to my mom….. Some of our family gathered later in the day for baked ham, scalloped potatoes, and grilled leg of lamb. 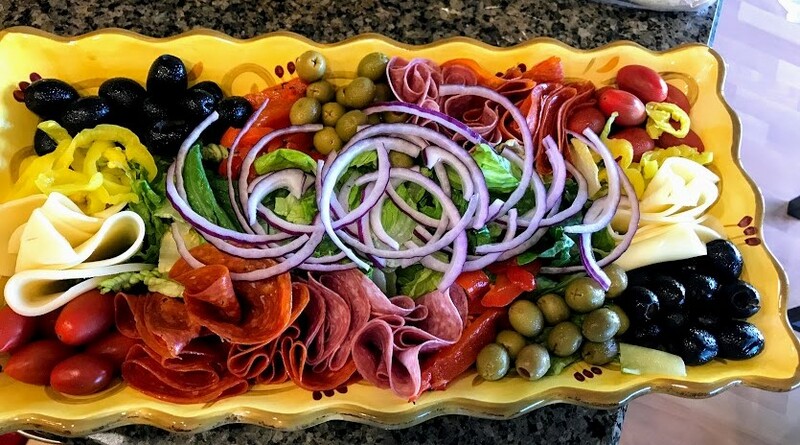 My sister-in-law Sami made a gorgeous antipasti salad….. Sometimes food is so beautiful it can make you cry. I hope everyone’s Easter Sunday was as good as ours, and I hope your Easter memories are pleasant. Nobody cam make an antipasti like Sami! I think Mom took the winter picture of us because she thought we were adorable. I hope you label the picture on the back with everyone’s name, so your grands will know who they are. The stories are good also! I love scalloped potatoes — yum!!! !